Romancing the Beer. 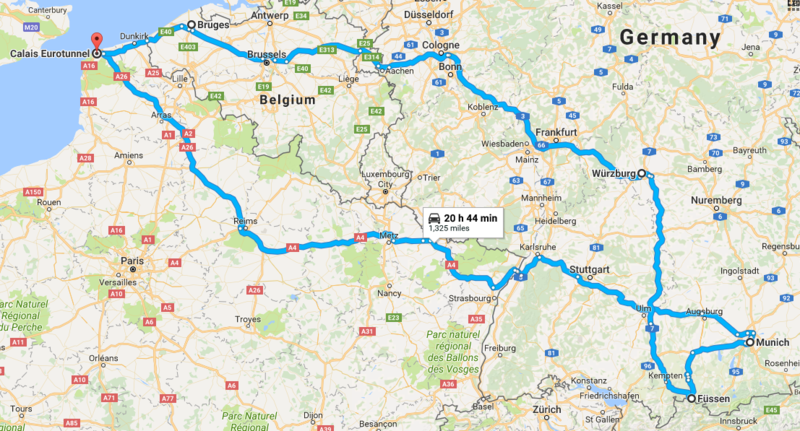 A journey of Champagne, Castles, Medieval cities and Beer. If you are a beer lover, Autumn is the season to be in Bavaria. Every year from mid September into early October all roads lead to Munich home of the mighty Oktoberfest. Our genuine VW California campervan hires are the perfect European grand tourers. Comfort, safety and fuel economy has never been so stylish! Just remember on a trip like this, please do not be tempted to drink and drive. While it is never a good idea, you must remember that France, Germany and Belgium have much stricter limits than the UK. If you are worried about being a beer widow, you shouldn’t, the first leg of this road trip takes you through Champagne Country. Surely it would be rude not to call into Épernay for the night, wouldn’t it? And besides, having been on the road for 3 hours after leaving the Euro Tunnel your’e probably ready to put your feet up and try a few bubbles. So the Oktoberfest campervan road trip continues and it’s still another 7 hours driving to get to Munich. Unless you are counting down the missed drinking hours in the Schottenhamel tent, you will probably want to break the journey. The medieval border city of Strasbourg is the perfect half way point. You could spend days exploring the twisting lanes of the Old Town full of wonderful crooked half timbered buildings. It is also home to France’s second largest student population, so you can expect the city to have quite a buzz. So, three and a half more hours on the road and finally you arrive in Munich. If you want to get there for the opening ceremony, Oktoberfest 2018 kicks off on Saturday 22nd September in the Schottenhamel tent. At noon the Mayor of Munich will have the honour of tapping the first keg of Oktoberfest beer. Once the barrel has been tapped, all visitors will then be allowed to quench their thirst. If you want to be first for the action be aware that the best seats are snapped up as early as 9am! This year the festival continues until October 7th so don’t worry if you miss the opening, there will be plenty of beer flowing throughout the festival. Following on the romantic theme the near by town of Füssen marks the beginning of the Romantic Road (Romantische Straße). A picturesque 350km route through the forests and mountains of Bavaria and Baden-Württemberg, ending at the town of Wurzburg. The next treat on the return journey of the Oktoberfest campervan road trip is a 65km stretch of the Upper Middle Rhine. Designated a UNESCO world heritage site between the towns of Bingen, Rüdesheim and Koblenz. You will discover breathtaking views of the mighty river Rhine as a back drop to terraced vineyards, ruins, castles and medieval towns and villages. With the final city destination beckoning, the Belgian beer mecca, Bruges, you may want to zip down the Autobahn. In a little over four hours you could be settled in the central campsite, contemplating where to sample your first Belgian beer. From Bruges you are only a hop skip and jump from Calais and home.